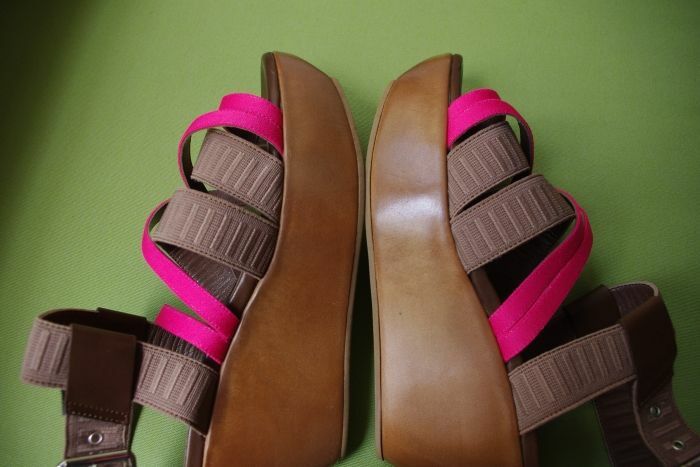 Found the perfect wedges to prance around in all summer. 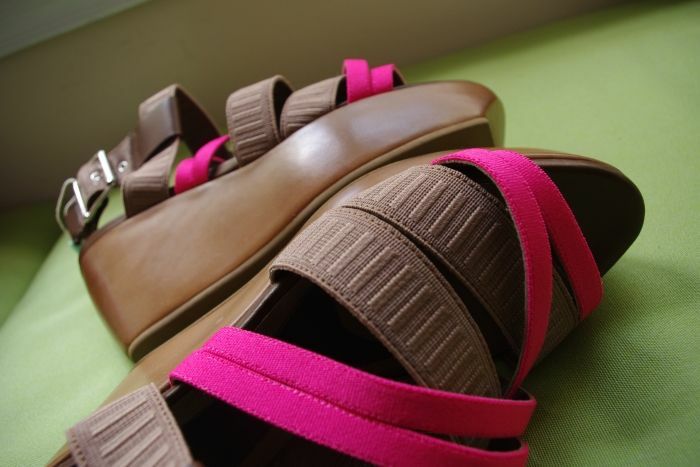 I snagged these hotties from the Marni Preview Sale at Yoox. They have the perfect mix of sport, class, and shocking pink. I really can't get over my infatuation for wedges. The love affair continues. Additionally, I've been looking for a good pair of "paper bag" shorts, and I accomplished my mission at Zara. Is it just me or does Zara's clothing run large? These shorts were the smallest size and still fit baggy around the waist. Come to think of it, maybe that's why they call it "paper bag." I love the olive green color to go along with the whole safari theme. More khaki and earth tones I say! And finally... I'm wearing an amazingly gorgeous piece from Kelly Framel of The Glamourai. 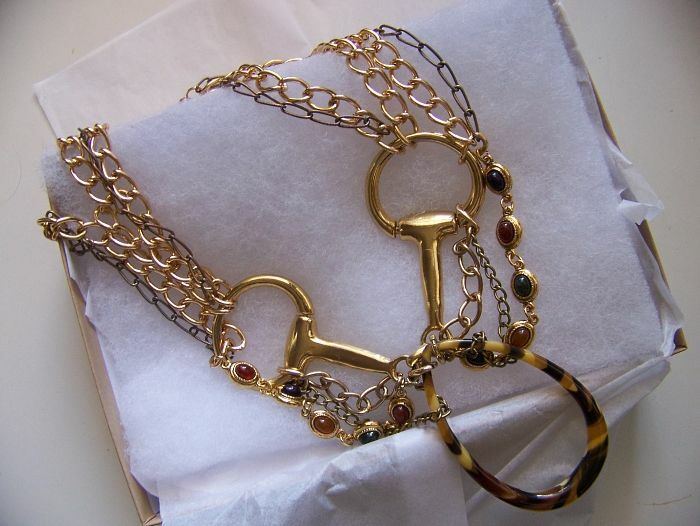 The necklace is super chunky and made completely out of vintage pieces. This was a complete impulse buy, and I didn't realize how difficult it would be to find the right outfit to wear it with. You see, I am just not as glamorous as Kelly and didn't want to make the wrong bold statement. That girl can pair crazy prints with huge accessories and still look amazing. I, on the other hand, would just look plain ridiculous. So I've held onto this piece since December of last year to finally debut it in May. I made sure I paired it with a simple top to make the necklace itself the main showpiece. Although Kelly's style is on the opposite spectrum of mine, her wardrobe mixes inspire me to break out of my shell and try out items I would never have worn otherwise. And that, my friend, is the power of a fashion blog! love those marni wedges! i actually tried on that same zara shorts the other day... they look so much better on you! What a lovely outfit, want those shorts! I LOVE the necklace, but understand that it's hard to find an outfit to go with it. That's happened to me many a time with gorgeous, chunky pieces like that. Love the satchel, and the shorts (they don't look too big - perhaps you're right, that's how they're meant to fit?) - so chic. You look so elegant in this outfit :) I like it! I've seen the same pair of shorts, I have to find the time to go and buy them! I like your shoes, they look comfy! I'm mad about wedges this year! i absolutely love this outfit and you totally rock that necklace. i really think you could wear it with just about anything and it would look great. love your wedges as well. sweet! I love this outfit, I love how the wedges bring colour to your outfit! Anddd that necklace is awesome! I'm a big fan of all things equestrian. You look absolutely amazing, everything's just perfect! The outfit is amazing too:) Thanks so much for your lovely comment and I will be back here...You have a great blog! Gorgeous! Love the wedges and the whole outfit! Fabulous outfit, the shoes make it pop! you are really beautiful! 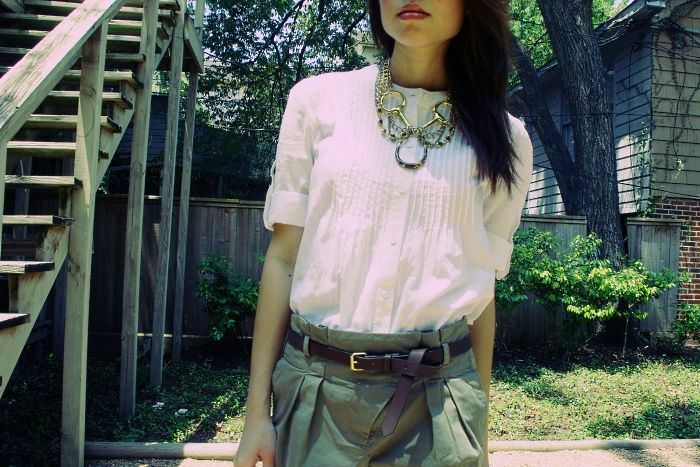 Love these shorts and the top, very Chloé! Love those shorts!!! They are so cute!!! Hope your weekend was lovely! I have those shorts! They are pretty amazing no? Great look! ur marni wedges are super!! I have the same shorts :) im just waiting for the sun to come out!!! love the pink! great photos. Me gusta tu outfit, adoro The Glamourai!! Gracias por pasar a verme. Bstoss!! those are perfect summer wedges. they look chic and comfortable. i'm having serious shoe envy, i broke my foot and can only wear one sneaker at a time all summer! Really great details to this outfit, lovely shoes!!! You look very nice!I adore your shorts,and the little bunny of course. I love your khaki shorts! love this outfit. The necklace goes really well with it! p.s. i went to college with Kelly! she's still just as awesome as back then. Those wedges are awesome, love. Great look i love these shoes so much never seen like that before!